This third post in the series explains how I extended my stack to multiple servers with Docker Swarm. In the previous post, we have brought up a small ARMv8 server running Armbian and installed Docker on it. 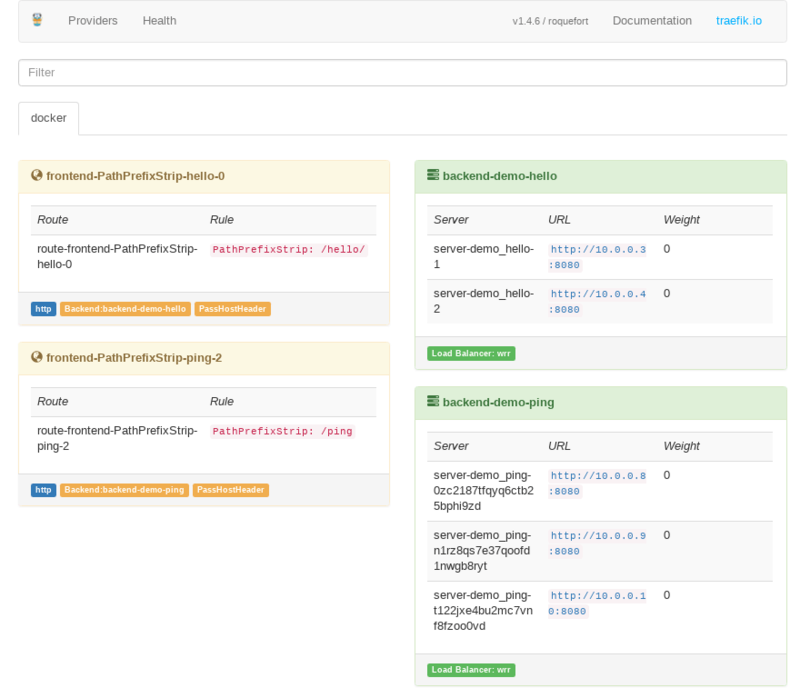 We also had a look at configuring multiple services on a single box using docker-compose, and I showed a very simple pipeline for automatically deploying changes and new applications from a version controlled repository where the configuration lives for them. This works for a handful of applications, but what happens when you need to scale out to multiple servers to have enough resources for all your services? If you like how you can define configuration for your services with docker-compose, you’re going to love Docker Swarm! You can use a very similar YAML description for the whole stack with additional features for deployment logic and configuration management. The concept of a service is much more emphasized than in Compose. Each service encapsulates a number of tasks that will be scheduled on nodes in the cluster. The orchestration and lifecycle management is all done for you, you just need to take care of the configuration. Let’s start with setting up the servers first. To start with, let’s assume we have 3 boxes with the same CPU architecture, running Linux and they all have Docker installed already. Pick one leader and make the other two worker nodes. For this post, we’ll imagine amd64 hosts with the IP addresses 192.168.2.1, 192.168.2.2 and 192.168.2.3, with the first being the leader. Log in to the first box and initialize the Swarm. Swarm initialized: current node (jbrvijh5o4ae9gss5u3st2p45) is now a manager. So far so good, the 3 nodes all show up and one of them is a leader. The recommendation is to have odd number of leaders, because scheduling and cluster management needs consensus through Raft and even numbers of leaders might be split about the current state of things. If you’re familiar with docker-compose already, then deploying a group of services as a Swarm stack will feel very similar. You can use the same YAML format to describe the services, their settings and configuration. Let’s look at an example! We have a few things going on in here, let’s start with the Python services. They are both simple HTTP servers that respond to GET requests with a fixed message and their hostname. I love how simple but powerful Python is. Using only standard libraries we have a simple HTTP endpoint in about 15 lines. Just awesome! Sure, this is not a production-ready server or production-quality code, but I find it amazing how easy it is to code something like this up in Python for demonstration purposes, for example. Anyways, back to our stack! The third service is an awesome, modern reverse proxy, called Traefik, which was built with dynamic backends in mind from the start. This makes it perfect for routing traffic to services running in containers that may come and go all the time when their configuration changes, for example. Traefik is super powerful and there are lots of nice things built into it (like HTTP/2 support, automatic SSL with Let’s Encrypt, metrics support, etc. ), but for this post, it’s enough to know that it can read state information from Docker and adjust its routing configuration automatically based on metadata. Make sure to check out their excellent documentation if you’d like to know more about Traefik! In our example, requests to /hello/<name> will be handled by the hello service and requests to /ping will be served by tasks of the ping service. This is configured for Traefik through the traefik.frontend.rule labels defined in the YAML file. The command above has created the services and the new overlay network (demo_apps) for them. Services in Swarm stacks are prefixed with the name of the stack. Some configuration will need this (demo_ in our example). All containers started by the tasks will be attached to this network where they can talk to each other using service names as hostnames, even if they are running on different physical hosts, pretty cool! Overlay networks are neat, check out the documentation on the link if you’re interested to know more about them. The containers also get their own unique IP addresses on this network and as they start up, Traefik will add routing to them using these addresses. You can see this on a nice dashboard at the http://localhost:8080/dashboard/ URL. You can see that the requests were distributed across different instances of our services. ping was configured as a global service, meaning it has one tasks scheduled for every node in the cluster, while hello has two replicas scheduled to any of the nodes. You can see where they are exactly using the docker stack ps command. You can also notice that the Traefik container is always running on the leader node. This is done by the constraints defined on the service and it is necessary, so that it has access to the tasks information using the Docker API. It also needs a connection to it, this is why it has the /var/run/docker.sock bind-mounted to it. If you used docker-compose, you know how easy it is to share files or folders from your host with the containers. When running tasks spanning multiple nodes in the Swarm cluster, things could get a little bit trickier. The problem with this is that the ./sample_http_server.py will be expanded to an absolute path on the leader node. If a task of the service gets scheduled to another node, it will expect the same file to exist at the exact same absolute path on the host. What can we do then? You could make sure the necessary files or folders exist on all nodes individually. This might work OK if you’re only mounting in read-only mode, but you’d still need to update the files on the host in multiple locations, which is not cool. The unknown users (like ones that only exist inside a container) will be mapped to a known, existing uid and gid. I’m still having issues with some my services not being able to share these directories from all the nodes, but I think it’s to do with how my setup has evolved and not necessarily with this method, YMMV. The service configuration in the YAML would look something like the above. You’ll also have to make sure that the shared folder exists on all servers, so it means a bit of manual setup when adding a new node to the cluster, which is not awesome. I’ve recently learned that Docker also supports NFS mounts natively. This is very similar to the option above with one important distinction. You can declare your NFS mount targets on the containers and that means, the mount doesn’t have to exist on the host. Note that the kernel still has to support NFS and the hosts have to have the required libraries installed, nfs-utils for example for Debian based systems. Now, as long as the target share is available, we can start containers using files from there. If the share goes away though, it’s bad luck for your services. Another option worth mentioning for read-only files, like webserver configuration, that you know when the containers start and can only be updated if the related service is updated too. Docker service configs allow you to save data (text or binary) in the Swarm cluster and mount it in containers as a file. Service secrets are defined in a similar way (generally just a change from configs to secrets), but Swarm will also encrypt these. Be aware that both configs and secrets are immutable, so you won’t be able to update them. You can also not delete them as long as they’re in use by at least one service. Docker’s plugin system allows registering additional volume drivers along with the ones built-in. You can, for example, bind a volume to an S3 bucket or a NetApp share. Check out the documentation to see what’s available, or search on GitHub for other open-source implementations. Depending on your use-case, you might find people having the same problem where they already solved it in a reusable way. Let’s look at a small example for CIFS shares, using the Netshare plugin. We’ll grab the binary, start the plugin and start a container using it. This can easily be adapted for Swarm services as well. If you’re switching from a Compose CD workflow to Swarm, the easiest change would be executing docker stack deploy instead of docker-compose up. Be aware though, that this may cause your services to reschedule their tasks on every invocation, which might mean container restarts. Make sure you have a sensible update-config if you go for this. Better yet, make sure you have one in any case! I’ve opted to use webhooks as triggers for updates on my stack. I have a set of webhook-proxy applications running in my Home Lab, one is available externally, that validates the requests and posts them to another, internal instance, that also have access to the Docker engine through the API. The latter is the instance where the main update logic is implemented. There are a couple more bits and pieces in the actual pipeline but this is the main logic. Very similar to the docker-compose + cron way, but instead of constantly checking from Git, we just wait for the external service to signal us the change. You can see an extract of these here, in the webhook* files, that can give you a better idea of what is going on. Hope you enjoyed this rather lengthy walkthrough of using Swarm services instead of local Compose projects! In the upcoming posts we’ll look at auto-configuration of services and also monitoring and logging. Let me explain the configuration method I use for my services and HTTP endpoints. Spoiler: it’s Docker and it’s automated. In the second post of the series I dive into the details of what is involved setting up for an ever-growing number of applications on a handful of physical servers on my Home Lab.